This collection of images is neither perfect nor complete. 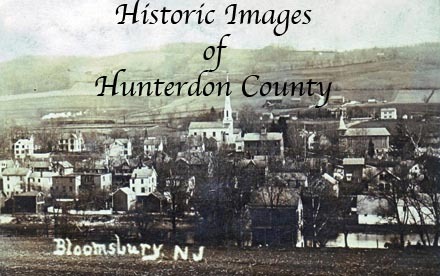 Still, it should provide something like a window, admittedly smudged in places, into Hunterdon County's past. Most of the inages are postcards. The vast majoriity of them date from between 1900 and 1930. Images from the Historic American Buildings Survey date from the mid 1930s and the early 1960s. With some exceptions, captions tend towards tersness, but information on this site and others may satisfy those who want more information. It should be noted that the bulk of the images here were downloaded from a popular auction site, there is one importsnt exception. The Historic American Building Survey images from the Library of Congress which are identified by the letters HABS at the end of their captions.